Already riding high after the release of the groundbreaking “Sgt. Pepper’s Lonely Heart’s Club Band” just weeks before, the biggest band in the world further solidified their status as larger-than-life pop culture icons on June 25, 1967. On that day, 300-400 million people around the globe watched and listened as the Beatles introduced the song that would come to define the Summer of Love and the hippie philosophy in general on what was also the first international, live satellite TV broadcast. This first live, world-wide satellite TV program, “Our World,” was conceived by BBC producer Aubrey Singer, who invited artists from different genres, including painter Pablo Picasso and opera singer Maria Callas, to appear in segments representing their respective nations. When it came time to broadcast, 14 countries took part in the program, and 31 nations tuned in to watch. Participating countries were asked to produce two segments that best represented their nation’s identity and culture; the BBC asked the Beatles to represent the United Kingdom. They also requested a little ditty written especially for the show that was simple enough so non-native English speakers could understand it. John Lennon, who just a few years before almost beat a man to death for implying Lennon was gay, whipped something up about love. After one rehearsal, the Beatles gathered at EMI’s Studio One surrounded by pals including Mick Jagger, Marianne Faithfull, Eric Clapton and Keith Moon. The room was awash with color thanks to the cheerful flowers and balloons festooned everywhere. The young musicians were clad in bright, eye-catching hippie garb that stood in sharp contrast to the tuxedo-clad 13-piece orchestra hired to back the Fabs, who must have felt just a tad out of place. When the Beatles began their performance of “All You Need Is Love,” the vibe was friendly and festive. They invited their friends to join in on the chorus, giving the performance the feel of an informal jam session rather than a global satellite transmission being viewed by hundreds of millions around the world. We were big enough to command an audience of that size, and it was for love. It was for love and bloody peace. It was a fabulous time. I even get excited now when I realize that’s what it was for: peace and love, people putting flowers in guns. “All You Need Is Love” immediately shot to the top of the American and UK charts in the summer of 1967. It perfectly summed up the buoyancy and optimism of the time – and I hear tell if you blinked, you missed it. 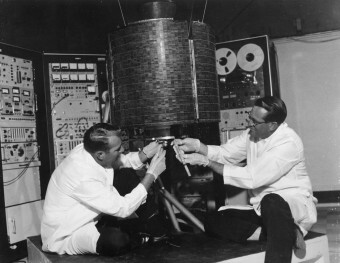 The satellites used in this inaugural global satellite broadcast were Intelsat I, Intelsat 2-2, Intelsat 2-3, and ATS-1. Intelsat I was also used in showing the first live splashdown of a spacecraft, used to broadcast the Gemini 6 splashdown in 1965. It initially went out of operation on January of 1969, but was turned back on from June to August of 1969 to cover Apollo 11 after one of the other satellites used during the mission went down. Intelsat I was also re-activated very briefly in 1990 on the 25th anniversary of its launch. It used a mere 40 watts of power and was only about 2.5 ft. tall.